Yes i was crazy enough to waste my feul checking EVERY map in game to see what areas are autoable. There are already various guides avaliable for training but still there are those who don't wish to search or what they find is not helpful to them. So i hope this atleast helps a few. This is made to Train RB and NON RB pets and Players alike. Without the "How do i train fred, elin, niss, clive, blahbalhablh question" cause this works for anyone and any pet. I personally have lvled a lotta chara past 100 without burst, many along with their pets, often without a water and its not hard at all. These are some paths i've taken along with a few more places i added to help you so you can chose the path you prefer. Many of the items they drop can be used for manufactering, food to cook which you can sell to make money or keep to eat for training. And all other drops except uncooked fish can be sold to NPCs for quick cash or sold to player who may need them. You may ask me "why is Egypt or Japan or Blahblahblah not here?" Well thats because i only recorded autoable maps. 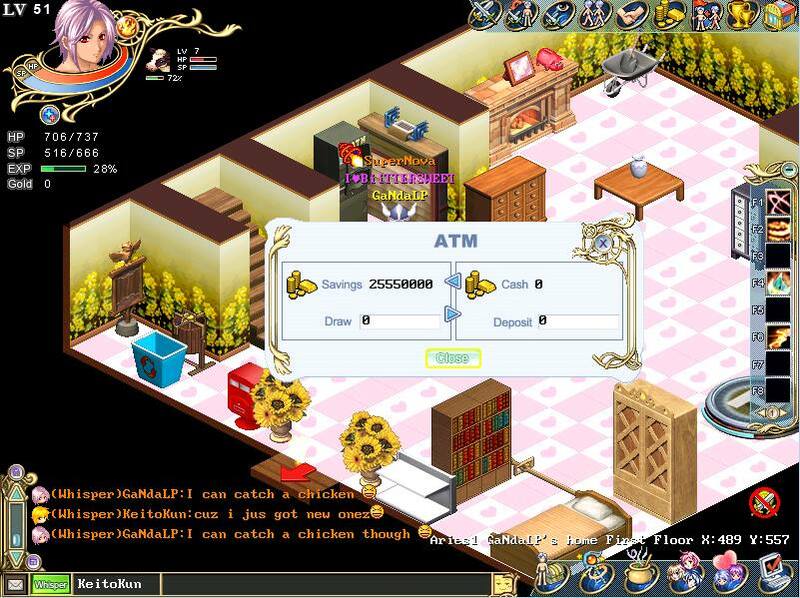 This is for auto walk only, so that lvling/collecting goes faster. But like I said above. if you want to sit that's fine too. If you find you spawn to much then sit down or go to a lower lvl area or a less crowed monster area (where they spawn 1 or 2 at a time) instead until you are ready. Always train with a pet or team mates, to ensure that you are not combo'd upon causing you to spawn. Don't forget to set auto spawn on... Now lets begin. All Monsters 1+ has a RARE chance to drop Purple chest. I suggest Keeping them. Edit; Changed "packs" to "event packs"
really helpful and detailed. I will use this info for sure if I ever get back to Clive training. I think she means Purple chests. @fox; good luck with clive. @xenia & Vamp; Sorry and yes i did mean drop event packs. 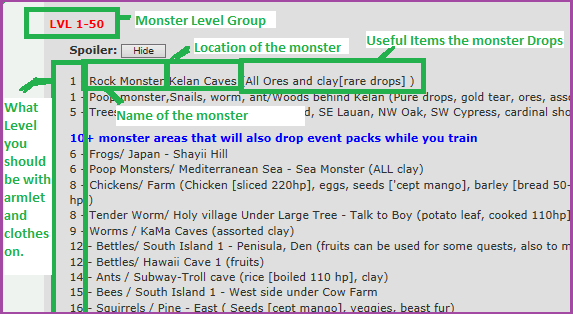 i mentioned above "10+ monsters to drop packs" but i will change it all to "event packs" for future people. thank you and sorry. It doesn't entirely state what level is needed to go to.. It just lists them. what ever lvl it mentions is the lvl you need to be in that area to train safely with gear on. if you have any questions i'd be more than happy to answer them. Confusing..what level am I supposed to go to rocket men..? So, when we get to the level stated on the side is when we can go to that monster and train safely without worrying about our equips breaking. Add 19 to the level on the side tell me the level of the monsters? (most of that I get). What I don't understand is how long we can train on said monster efficiently and when we should stop training on that monster. efficient training depends on many factors: number of spawns, how often you get into a fight, how often they kill your pets, how often you have to stop to get healing foods(or not, if you have a e-remote water), etc. you gotta consider these factors when choosing a place. example: Oslya is a good place to train, especially on raptors, because you get good meats often and you can pretty much auto-heal without running out of them, BUT, if you train outside, you risk running into random drowcrushers that can break gears, and if you train inside caves, you won't get drowcrushers, but you'll get more mobs per battle and your pets could die more often. you'll probably have to figure some of this stuff yourself, since that would be too much to ask of an already detailed guide. Ghostship is hard to find at times because it travels around between Sky City and Australia. So its often a waste of feul traveling around unless you know what you are looking for or wait for it to come to you. So i suggest ghost Isle. I think they may drop the same items. The ghosts are on the second floor, skeletons on the fisrt. There is also less spawns in ghost isle than ghost ship. They also debuff so it can be dangerous aswell incase you get terra'd or mess'd. XD grats, make sure they's nakie. Also if you ever need more hp you can always do the daily armlet quest in welling. Yes, most pleases are better in teams, but you survived and were able to revive your chars thats what's important. You mentioned that your lowest chara is 65, the poles may be to low after a while.. expecially for your Hayate. so dunno what exp you get there... still good for your 60 charas but a good place i can think of that you may want to try is going to Cairo. The cave behind cairo. Hold a sec i'll log someone and make some screenies to point you in the direction. The good thing about this spot is i know its safe, i even lvled a few 40+ pets there and they were fine (with water in team obviously) hp ranged from 400-800 ish but i guess it depends on the defence. You can also get clear devil spar pieces here, so thats a good sell. (dunno how much it goes for in your server but in most servers its 10-50k each) also carry a book 2 and 3 with you to stack. Check the +19 lvl diffrence. You can also play safe with +18 or make sure pets are nakie instead. Also safer if pets had 5-600hp lowest. Compared to you i like to take risks so thats why i say you should have more than 500 or 600 to garantee pets do not spawn. Also have your water sleep or freeze to minimize attacks ot chance of combo. XD yea thats why i mentioned it, thought you may like it. ARmlets should be fine. but just incase i hope its not a good one you want to keep like la'tim or belly chain. Aniways stay there till you are ready to go to trees and then from there rome and you'll be well on your way. I even have a good spot in rome that doesn't get you spawned (as much or at all). i can show you if you want me to, let me know. Don't forget to hold 1 spar, a book 2 and 3 each on your chars to stack. XD good luck. If you need anything else please ask. I would like to ask what is the def that you are assuming for this set up? or what gears do you have? I am level 23 with level 90 def however I always die in cirrus. Are you training alone or with a pet? Do you have food and also what is your HP? You say you have 90def so i'll take a guess and say your hp is around 300-400ish that more than enough to survive cirrus... reason you may be dying is because you are either alone or your auto eat is not high enough. I suggest training with a pet so its easy to combo and damage is spread out and not focused on you. An ATK based pets you can try is Roca. She's the highest hitting Newbie pet you can get. Unless you have someone who can help get you clive, elin (need to be 30 to get her gun, she's weak without it), vicky, hayate, louis, or w/e other pet you prefer. Set your auto eat to about 65-75% the higher you get and the more CON then you can lower the %. Check how much hp you are left with after a fight and you can adjust auto eat with that. If you find you still die then find a spot either near the Rock at the right top side or the gap next to the tree at the top left side. The left side has 2 spawns and no one usually walks there, while the right side has 3 spawns and people walk in its path. If you have any other problems or questions please ask. This guide is -wonderful-. I'll be bookmarking it for reference while training pets. (Gotta wear weights. xD) Thank you so much. You deserve 15 cookies. Welcome back, I'm not a full time player but I'm still around for questions. In concern to how this guide works I hope perhaps this will help. In the game there is a 19+ rule for what lvl difference you can be in order for your items to not break. So if you are training pets and you use armlets because their HP is to low. or you have them or yourself wearing clothes because your defence is to low. OR even weights because your spd is to low. Then this shows you what lvl you can be to wear all that without anything breaking. The left side show what lvl you need to be. Next to that is the name of the monster. Finally if the monster drops anything that's useful to you I added that as well. These are items you can sell to NPC or PLAYERS for money. or you can keep for manufacturing or eating. Yes, you can use your assist skills or attack skills. The assister uses w/e assist skill. Everyone else pokes or uses w/e magic or physical attack they choose.